What do the “Bay of Pigs”, the “Cuban Missile Crisis” and the war in Vietnam have in common? I think you’ll be surprised by the answer. You’ll have to tune in this week on Veterans Radio to find out. Our guest is Brian VanDeMark, professor of history at the United States Naval Academy in Annapolis, where for more than twenty-five years he has educated students about the Vietnam War. He served as research assistant on Clark Clifford’s bestselling autobiography, “Counsel to the President”, and coauthor of Robert McNamara’s number one bestseller, “In Retrospect”. He is the author of “A New History of America’s Descent into Vietnam-Road To Disaster”. That changes with “Road to Disaster”. He draws upon decades of archival research, his own interviews with many of those involved, and a wealth of previously unheard recordings by Robert McNamara and Clark Clifford, who served as Defense Secretaries for Kennedy and Johnson. 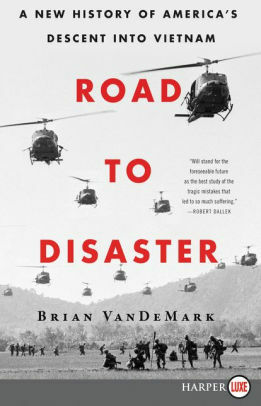 Yet beyond that, “Road to Disaster” is also the first history of the war to look at the cataclysmic decisions of those in the Kennedy and Johnson administrations through the prism of recent research in cognitive science, psychology, and organizational theory to explain why the “Best and the Brightest” became trapped in situations that suffocated creative thinking and willingness to dissent, why they found change so hard, and why they were so blind to their own errors. An epic history of America’s march to quagmire, “Road to Disaster” is a landmark in scholarship and a book of immense importance. Brian’s biography can be read in detail on his website. And Brandonn Mixer, co-founder of the Veterans Community Project. The Veterans Community Project is building tiny homes for homeless veterans in Kansas City, Missouri. Check their website for more information. Very interesting and enlightening program with Dale Thronebury and Brian VanDeMark. The thought that kept running through my head was, while I could not argue with his (Brian’s) conclusions, what would he do when faced with an immediate threat, ala 911? Unfortunately, one does not have the luxury of “the long run” in decision making Washington DC. I do not think the protesters had the “best interests” of America at heart.